a victim of being outdated. Many people put up with the frustrating aspects of their bathroom because a remodel seems too expensive and out of reach. Have you always had a stand-up shower in your house and miss your bubble baths? Is your oversized garden tub taking up valuable real estate? Or is your bathtub too small and you’ve just been putting up with it? Buckeye Custom Remodeling can completely change the look of your bathroom by remodeling it on your budget! Whether that means giving you more counter space, more storage space, a shower where a tub used up too much space or a soaking tub instead of a stand-up shower. We can recreate and reimagine your bathroom based on your individual or family’s specific wants and needs. When you’re planning a bathroom remodel, there is a little bit more to think about than when you’re remodeling a kitchen. For instance, the placement and kind of fixtures you purchase will depend on whether you’re remodeling your master bathroom or guest bathroom. 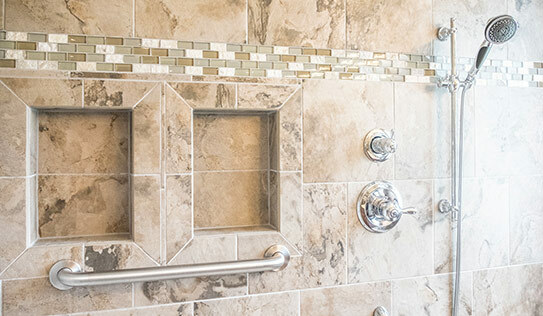 You may not be able to put a walk-in shower in the hallway bathroom, but we’ll help you make a plan for the best use of space no matter what the size! What bathroom features do you need and want? What features does your bathroom have now that you want to keep? Will the layout of your bathroom allow you to stay in your home as you age? Are you trying to sell this home or planning on keeping it? Think about what you want the bathroom remodel to accomplish and schedule a consultation with our team at Buckeye Custom Remodeling. We can develop bathroom designs that suit your needs and lifestyle!